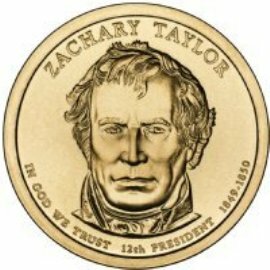 The Zachary Taylor Presidential Dollar marks the twelfth in the series. The coins were first released into circulation on November 19, 2009. Taylor served approximately one year and four months as president before his death in 1850. Millard Fillmore replaced him and carried out the remainder of his term. belonged to a political party before he ran for president at the age of 62. The reverse of this golden dollar shows a portrait of him with his name inscribed above, "IN GOD WE TRUST" and "12th PRESIDENT 1849 to 1850" is inscribed below.